Purchasing copies of gOld on the Eldercation website will benefit older individuals served by the following extraordinary non-profit organizations both of which encourage the power and continued growth of the creative spirit. A portion of the proceeds generated from each gOld sale will be donated to Arts for the Aging (AFTA) and Elders Share the Arts (ESTA). Arts for the Aging (AFTA) -Now in its third decade, Arts for the Aging is a pioneering organization that provides outreach programs specially designed to engage older adults in health improvement and life enhancement through the arts. Research shows that regular participation in programs like AFTA's help to minimize age-related physical and cognitive impairments, and contributes to better physical, intellectual and emotional health. To learn more about Arts for the Aging, please visit its website at: www.aftaarts.org. Elders Share the Arts (ESTA) - Elders Share the Arts affirms the creative potential of older adults and upholds their time-honored role as bearers of history and culture by using the power of the arts to transmit their stories and life experiences for the benefit of all generations. ESTA provides a broad range of arts programming for older adults, ages 55 and older, within senior centers, libraries, NORCs (naturally occurring retirement communities), long term care facilities, and other community-based sites. To learn more about Elders Share the Arts, please visit its website at: www.estanyc.org. What if growing old didn't have to mean being obsolete or over the hill? What if, instead, it meant being classic, venerable and wise? What if it meant writing the novel you've always wanted to write, or painting, or singing, or teaching, or traveling to a place you've always dreamed of? 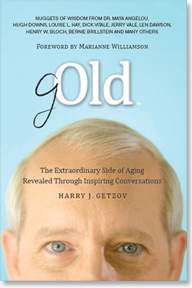 In gOld, Harry J. Getzov introduces us to many of the extraordinary senior citizens he has interviewed from all walks of life as part of the Eldercation project he created to promote the concept of positive aging. These folks talk freely about lessons learned and wisdom gained and share their feelings about aging, demonstrating that life after 65 can, indeed, be passionate and beautiful. A precious treasure lies hidden within our older population waiting to be revealed. gOld opens the door to its revelation and suggests that it is time to change the way we think about aging and about our elder citizens. "'It simply felt good to be around him.' So writes Harry Getzov in gOld about the beautiful gardener who had a powerful, positive influence on him as a child. We can say the same thing about all the wonderful individuals who appear in gOld: it feels good to be around them. To hear their wisdom. To marvel at their experiences. And to realize that aging is not something to dread, but rather to look forward to." "This is the moment to embrace gOld. Harry Getzov has created an informative and easy-to-read collection of fascinating interviews—compiled from visits with people throughout the country. Beautifully written, gOld provides us with a broad perspective on what gives meaning and purpose to life." "This is a book not to be missed by anyone who is either growing old or plans to grow old, and wants to do it well." "Harry Getzov likes to interact with well-known people and ordinary Americans. As he listens to them recount highlights and low points in their lives, he distills these elders' zest for living. By sharing with us some of the many voices of experience, gOld makes baby boomers like me (and probably younger readers, too) look forward to his next collection." "In an age where so many of us live our lives far away from families and loved ones—from our roots—the recollections that appear in gOld, written with such a warm vernacular, bridge that distance and remind us that storytelling isamong the greatest of gifts that everyone has to offer." 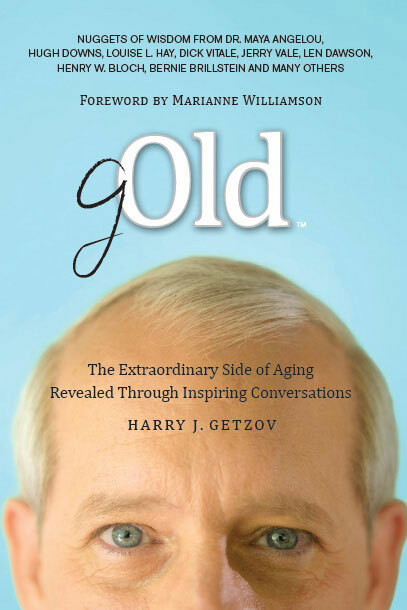 "gOld provides a venue for dispelling myths associated with aging by highlighting the heterogeneity, resilience, talents and wisdom of older individuals. Those of us who have not yet reached the developmental stage of later adulthood should be thankful that Harry Getzov has devoted so much time to collecting these inspirational stories—sharing with us the lessons conveyed to him by some very special people." "God gave you a chance to become somebody. If you didn't take advantage of that, and you didn't roll your sleeves up and go for it, then . . . I'm sorry. Don't give me that 'poor me' and become the victim. . . . Someday, somewhere, someone's gonna give you a shot. And you better be ready for it." "The end of life is when they put the cover down on you. But in the meantime . . . you gotta keep moving. . . . A lot of people say, 'How come you never stay home, Fred?' I say, 'What am I gonna do—sit here and wait for somebody to call?' "
"I don't have any age. . . . I've been working out so much, I forgot to get older myself. . . . The key is having something to work toward; that's the secret of life. I don't care what age you are . . . you have to have a passion for something." "It's really hard for a young person to understand, when they see a senior citizen, that the older person, inside, is just as vital and just as interested in things as anybody else." "Your questions, your book, your work, your intent are not only timely and important but gracious."